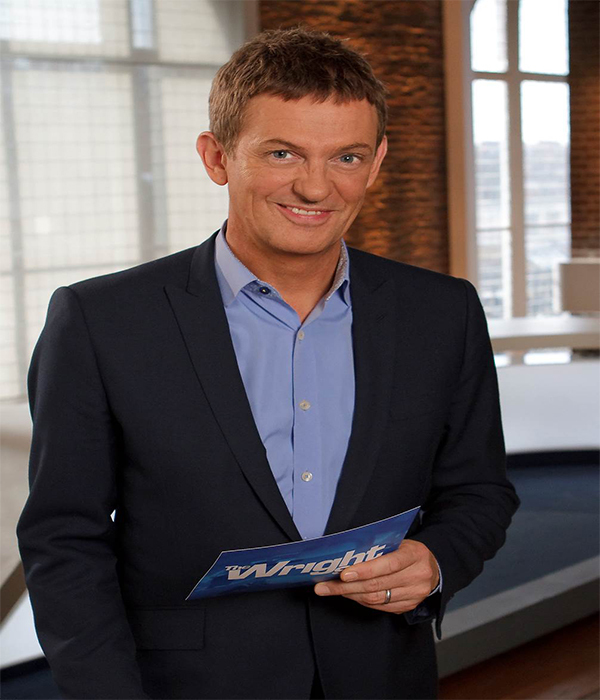 He is best known for his witty banter on his daytime panel show, The Wright Stuff. But less known for his passion for the Sixties, music and walks in Regent’s Park. Here, the TV presenter talks about his favourite guests, his dog Wiggy and love of London. Q: Who has been your funniest guest on the programme? A: Too many to list: Sir Ben Elton; American comic Scott Capurro is outrageous and a master at delivering near-the-knuckle adult humour at just gone 9am, often to the horror of The Wright Stuff lawyer. Shazia Mirza, Zoe Lyons and the brilliant Steve Furst all deserve a mention, too. They all make for a merry morning. Q: How did you get started in TV presenting? A: I starred in a children’s film when I was 14, a role that came out of the blue. It gave me a taste of working in front of cameras – I was hooked straight away. I fancied working in TV when I left university, but had no contacts and never got an interview despite filling in scores of BBC application forms. People talk about a media elite today, but I reckon it was far worse back then. Working as a newspaper journalist in the Nineties got me on a few TV sofas as a pundit and that’s when Channel Five spotted me. A: My wife Amelia, my dog Wiggy and my fishing kit. I’m happiest when I’m fly-fishing with Amelia under Wiggy’s watchful gaze. A: I’m already living in it! It’s nothing special, a former council house in Camden that’s been nicely done up. My mum was forever moving house when I was a child and that must have affected me as I’ve lived in the same place for 15 years now and I have no plans to ever move. Q: Are you working on any other projects or programmes at the moment? A: Channel Five want to give The Wright Stuff a big revamp for 2018, so I’m very excited to hear what they’re planning. Q: If you could work with any celebrity – who would it be? A: I love Sanjeev Bhaskar – he has that naughty twinkle in his eye. If they ever brought back the Kumars, I’d love to be given the full family treatment. A: It’s my home. I grew up in Croydon and moved north of the river after leaving university in Exeter in 1987. It’s the people of London that I love best and their wicked sense of humour, they make the city. I’m also lucky enough to walk Wiggy around Regent’s Park most days – what a stunning park that is. Q: If you could go back in time – which year would you choose? A: I try to live in the here and now as much as possible as I think always looking back, wishing for this and that, isn’t healthy. That said my inner hippy would have loved to hang out with the Grateful Dead in San Francisco back in the mid Sixties. I sometimes wonder what it would have been like if I’d been born 10 years earlier and lived through the Sixties – flower power and all that. Q: Have you had any DIY disasters over the years that you can tell us about? A: I’m surprisingly practical. I have three vintage motorbikes and maintain them for fun. I’ve not had to do any DIY for years as I love my home just as it is. Q: Who are your favourite architects or designers? A: Architects are not my favourite people as I’ve had to endure two basement rebuilds over the last few years, one was the other half of my semi. That was the most stressful experience of my life. I felt I was cracking up, my house acually did crack up. Q: What is the most important room in the house for you and why? A: My living room – it’s where my stereo is. It’s a really colourful room with lots of pinks and purples. I love sitting on the sofa playing my favourite CDs: Frank Zappa, the Dead, Gong and Hawkwind are top of my pops. Q: And finally, what advice would you give to anyone who wants to break into TV presenting? A: I always tell people not to consider presenting as a goal in itself. You’d do much better to develop some sort of skill first, get good at it and then get on television with it. TV is full of cooks, bakers, builders, journalists and the like. The Wright Stuff, 9.15 every weekday morning on Channel 5.